This sweet and savory salad is essential for this time of year. It has a hint of Fall flavors, with a little reminder of summer. The beet juice, lemon juice, and rosemary leave little room for anything to be desired, so seasoning is minimal in this recipe, and dressing is unnecessary. The arugula gives this recipe a little tang as well. Harvard beets are different from pickled beets. They're sweet and syrupy...perfect for this recipe! NOTE: This salad can be served hot or cold. I served it cold, but it still tastes delicious hot if you don't have the time to cool the quinoa. To save time, cook the quinoa the night before and let it cool in the fridge overnight. Total Cook Time: 30 minutes + 1 hour to cool the quinoa. 1. Cook the quinoa according to package directions. Let cool in the fridge for about an hour (optional). 2. 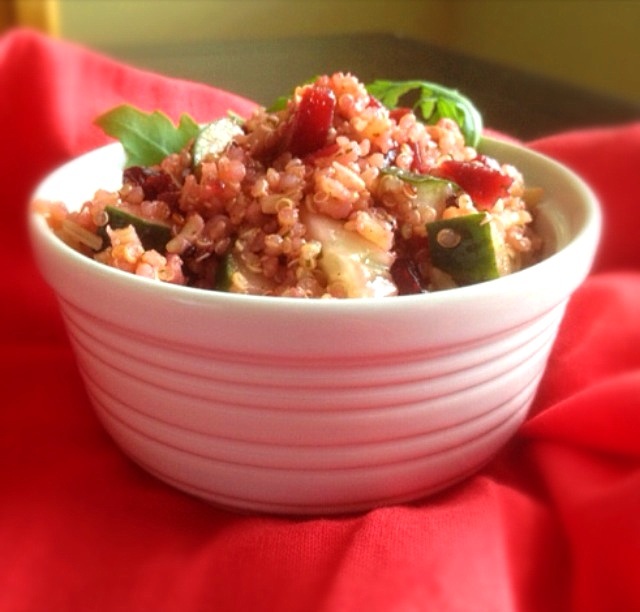 While the quinoa is cooking or cooling, chop the cucumbers and beets. Once the quinoa is ready, add the cooked quinoa, cucumber, beets, dried cranberries, lemon juice, olive oil, rosemary, and salt to a large mixing bowl, and mix together. Add the remaining beet juice (if you didn't add it with the beets), and toss to coat. 3. Serve over a bed of arugula or mixed greens.